You don't mind if I wax poetic on the humble sweet potato for a moment, do you? It's the unassuming treasure of the vegetable world. Unlike corn or tomatoes, which begin to convert their sugars into starches the moment they're picked, sweet potatoes actually convert their starch to sugar after they've been harvested. This means that sweet potatoes become sweeter and more digestible the longer they sit around. It's as if mother nature is allowing us that essential gratification that comes from garden fresh vegetables in the midst of chilly February when we long for it most. As if she's telling us, You can make it to Spring. I know you can. Here's something to tide you over. After indulging in sweet potatoes all winter long, I'm starting to believe her. I find that there is a point in mid-winter when I begin to dream about fresh vegetables. I even start to contemplate, in a vague and sentimental sort of way, the very unrealistic notion of becoming vegetarian (though I do admire those who are). Our meat-filled, heavy winter meals begin to weigh on me, both physically and mentally, and I desire something light, fresh and nourishing. I satisfy my cravings with large and diverse meatless meals. 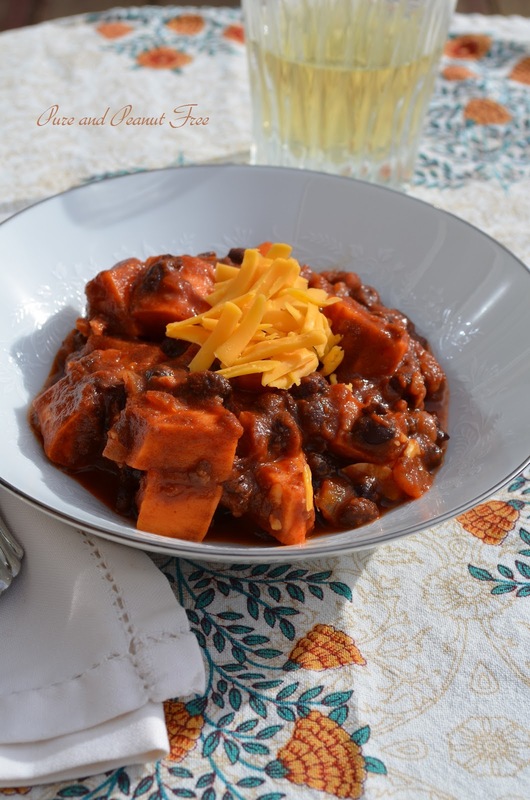 The combination of mellow sweet potatoes and rich black beans conjures up idealistic images of ancient cultures and faraway places. Add in a good dose of coriander and some spicy red chili and you have delicious winter chili that gets better over time. Serve it with a salad, warm skillet cornbread, and a variety of toppings for a very satisfying meatless meal. This dish is all about building layers of flavour. It starts with caramelizing the onions. Drawing out every last bit of natural sugar so it can brighten and sweeten the chili. This step is somewhat time-consuming, but I wouldn't skip it, as it adds such a complex, luscious dimension, which I feel is absolutely necessary to chili. Next you toast the spices, releasing their fragrance and creating an opulent smokiness that highlights the caramelized onions. 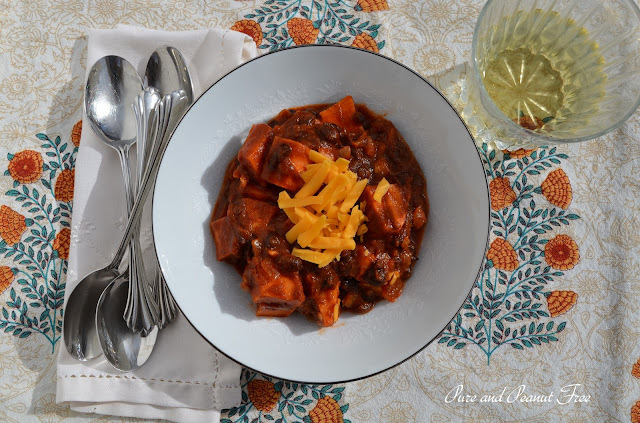 After that, it's a waiting game as the sweet potatoes and beans simmer in rich and spicy bath of tomato sauce, taunting you with the tantalizing aroma that fills your kitchen. By the way, did you know that February is national sweet potato month? I didn't either. As if we needed another reason to enjoy them right now. Heat the oil in a large, heavy pot. Add the onions and a pinch of salt and turn the heat to medium-low. Cook the onions, stirring occasionally until they begin to caramelize. This should take 20 - 25 minutes. Don't be tempted to rush the process. If they are browning too quickly, turn the heat down. When the onions are caramelized add the garlic and cook 2 minutes longer. Add the spices and tomato paste and cook until fragrant, about 1 minute. Stir in the tomato sauce, beans, sweet potatoes, and water. 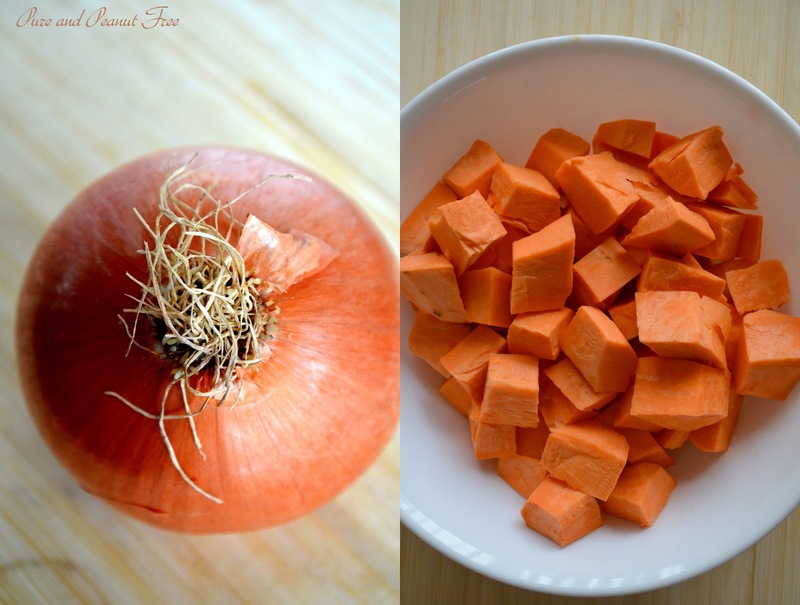 Cover loosely and simmer 35 - 40 minutes, until the sweet potatoes are very tender. Taste for seasoning. Top with your choice of condiments: grated cheddar, sour cream, tortilla chips, sliced avocado, or corn salsa. Serves 4.